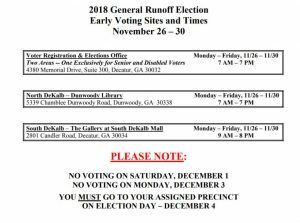 ELECTION UPDATE: After Tuesday’s meeting, the DeKalb Board of Elections changed its decision on early voting sites, adding Dunwoody and South DeKalb locations for the Dec. 4 Runoff. Download pdf. There was a big crowd at Tuesday’s DeKalb County Board of Elections meeting. There were two major items of business on the agenda: certifying election results from Nov. 6 and setting up Early voting for Georgia’s December 4 runoff. 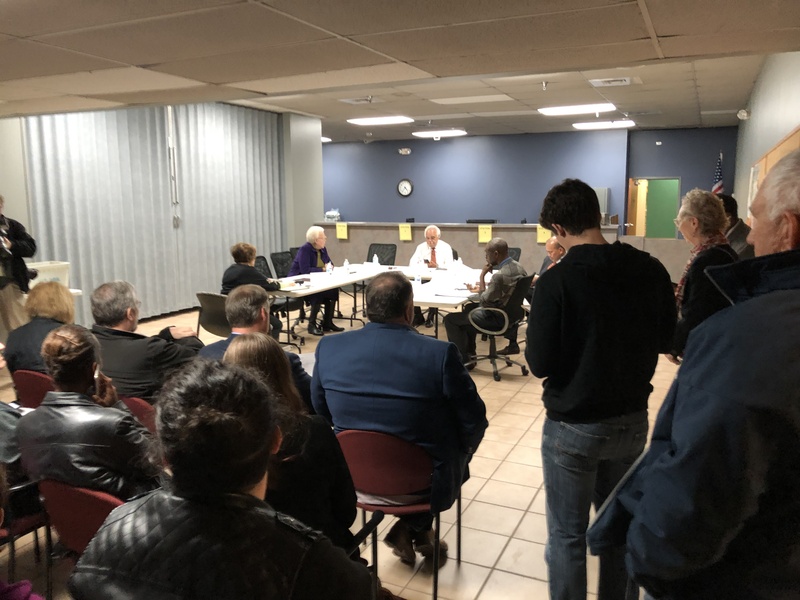 Despite the statewide drama, DeKalb was able to certify its election results Tuesday and send them to the Secretary of State’s office. New vote totals show Abrams gained 2,039 votes on Kemp (Abrams 2,309, Kemp 270) from additional ballots counted in DeKalb. As of this writing, Brian Kemp has 50.23% of the vote. Friday is now the court-ordered deadline for lagging counties to certify their election results. As for statewide issues, all the brouhaha over a close election puts a glaring spotlight on the shortfalls of a one-week deadline for counties to report their results. The one-week deadline should be extended for voters to validate their provisional ballots, as well. We are learning much as we go along. How many reforms will be made depends largely on who we elect to office. One thing is obvious: Electing Democrat John Barrow in the runoff to be our next Secretary of State is a crucial step toward making every vote count in Georgia, because Republicans believe the fewer votes, the better. And we all know what that means. At least we should. If you make a public comment, does anyone hear? In Tuesday’s meeting, Tillman remained silent as she spoke until he banged his gavel and told her that her allotted two minutes were up. I doubt that the issue of accessibility is going away. More than one public advocacy group shows an interest in pursuing it, and when I left the building after the meeting adjourned, nearly half the audience remained seated in place, as if something else should happen. Or was going to. A couple of notes about public comments: It would be very difficult to argue that they matter. It is the Board’s practice to sit in silence rather than interact. Questions are not answered. Complaints are not addressed. Very rarely are solutions offered, and when they are, those solutions lie elsewhere. Board members sit mute and unresponsive, except on those occasions when, at the end of the meeting reserved for member comments, Republican member Baoky Vu takes advantage of this safe space to push back against comments from the crowd. This is talking at, not talking with. I think the Board does its job fairly well, and people who deal with the staff and poll workers generally give them high marks, but the Board often stumbles in its dealings with the public. To be blunt, it has the PR sense of a turtle. One of the problems is lack of funds for staffing. The Board needs to bring on a public liaison staffer, a PR person who recognizes that communication flows both ways. At any rate, there are issues of transparency, openness, and responsiveness to requests for information that need to be addressed. I believe–at least I hope–that the Board’s leadership is willing to consider alternatives to the way it’s doing business. More on that later. 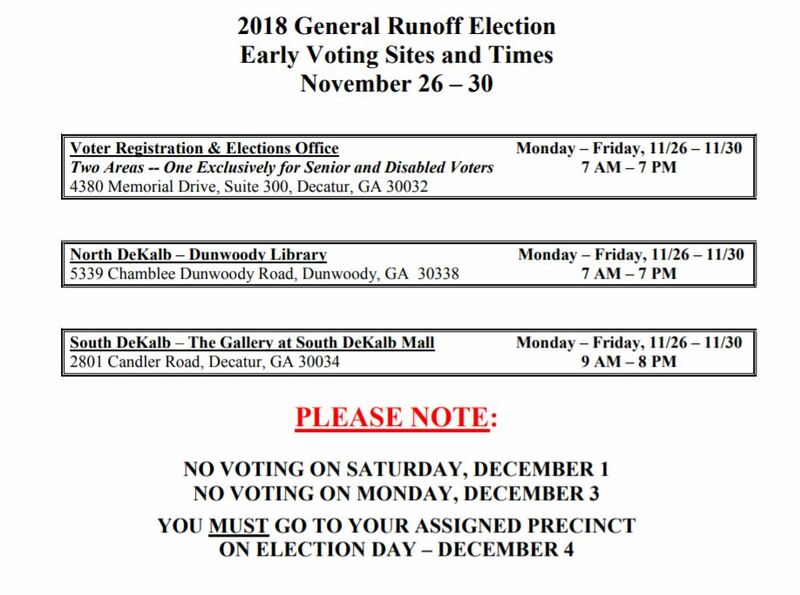 How can anyone say DeKalb’s elections went smoothly after they “lost” between 2,000 to 5,000 applications for absentee ballots? I tried to get verification on this claim and have never seen anything more. It became a they said, he said issue. If you have more info/receipts, please share with me and I’ll post, if credible.